In FireFox web browser your passwords can be exposed easily , so you need to know how to manage this password storing feature of Fire Fox browser while using. Passwords once stored can be deleted. 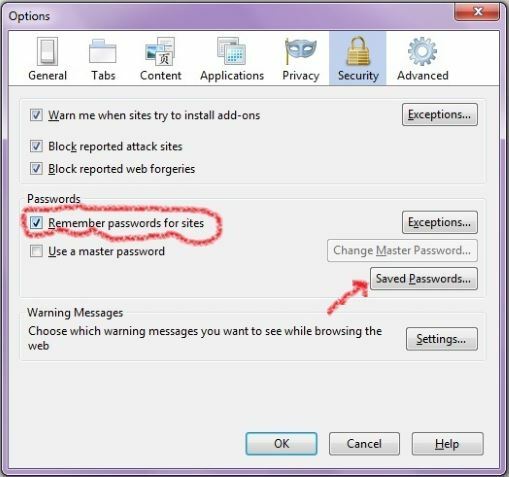 WE will learn how to set the browser not to store this feature ( if required ) , then how to see the already stored passwords and how to add exception or websites in which the password storing feature will not work. While using the browser after logging in to sites you must have seen the buttons asking to remember password , Not to remember password , never for this site . These buttons are connected to these features of the browser. Let us start with how to disable or enable password storing feature. The image above shows the check box which is to be unchecked if you don't want Fire Fox to store password. 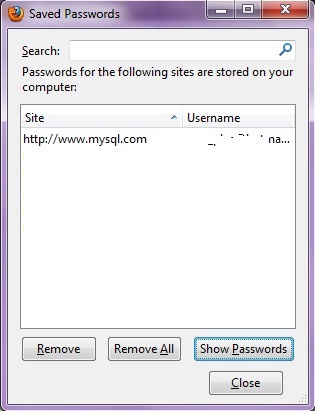 You can manage or view the stored passwords by clicking the button Saved Passwords. In the box you will see a list of Site name and usernames , then click Show Passwords, after a confirmation from the user Fire Fox will show all the passwords it stored. You can remove those passwords by clicking remove all button. In the main window there is a button saying Exceptions where you can enter the site names for which the passwords won't be saved by Fire Fox browser. So be careful when you tell Fire Fox to store your passwords, it may be required for some cases but not always. Never do this in public computers.